Begin your amazing discovery of China with a Peking duck welcome dinner. Your home for the next three nights is Beijing, your hotel is located close to the Forbidden City and many shopping malls. Visit China’s most iconic attraction, the Great Wall at Mutianyu. Look forward to an unforgettable evening at either the famed Peking Opera or the spectacular Kung Fu Show. Fly to Dunhuang, a major stop along the Silk Road known as the ‘City of the Sands’. Check into your hotel for the next two nights. Tonight, visit the Shazhou Night Market. Begin your exploration of the area starting with the Yadan Landform and Yumen and Yangguan Passes. Later this afternoon, ride a camel through the Singing Sand Dunes to the Crescent Moon Spring, an oasis named after its shape sitting amongst the rolling sand dunes. Begin the day with a visit to the Mogao Museum, Caves and Grottoes. Once home to many monks and nuns, the caves are a system of sanctuaries and temples filled with ancient Buddhist statues and paintings dating back thousands of years. You will be accompanied by a local expert who will take you inside a special cave, not available for the regular tourists to visit. After lunch drive to Jiayuguan for an overnight stay. Visit the western end of the Ming Dynasty Great Wall at the Jiayu Fortress and Pass. From the wall you will be able to see the Gobi desert. After exploring the fortress visit the Wei Jin Dynasty Mural Tomb. Later drive to Zhangye for an overnight stay. Gaze in wonder at the Danxia National Geological Park’s multi-coloured rock formations before flying to Xi’an for a three night stay. Marvel at Emperor Qin Shi Huang’s amazing Terracotta Warriors in the company of a museum curator. Stroll around the Big Wild Goose Pagoda and Thanksgiving Temple. Enjoy a special private after-hours viewing of ancient artefacts at a local museum and learn about the history of Shananxi Province from the museum’s curator. Enjoy refreshments overlooking the Big Wild Goose Pagoda. Visit a local painter’s home, famous for its rural peasant paintings. Learn about his art and enjoy lunch with his family. Explore Xi’an’s ancient city wall. Enjoy the Tang Dynasty Cultural Show with dinner. Explore the maze of markets in the Muslim Quarter before flying to Shanghai for a three night Special Stay. Stroll along the famous Bund and compare its heritage buildings to those in Yu Gardens. Explore the Pudong area and admire the view from Shanghai Tower, the tallest building in Pudong. Tonight, witness the renowned agility and skill of the Shanghai Acrobats. Wander through the Shanghai Museum and People’s Square. Alternatively, visit Zhujiajiao water town or cruise along Huangpu River. Later, enjoy time at leisure to shop on Nanjing Road. Take an early flight to Yichang and explore Chexi Town. Later board the boutique Yangzi Explorer. On board enjoy included wine and beer with your lunch and dinner. Inspect the Three Gorges Dam project site. Continue sailing through Xiling Gorge while sampling afternoon tea delights. Glide up Shennong Stream by longboat (sampan). Later, traverse Wu Gorge, known for its sheer rock walls, and Qutang Gorge, the most dramatic of the Three Gorges. Join an insightful excursion to Fuling to see the 816 Underground Project. 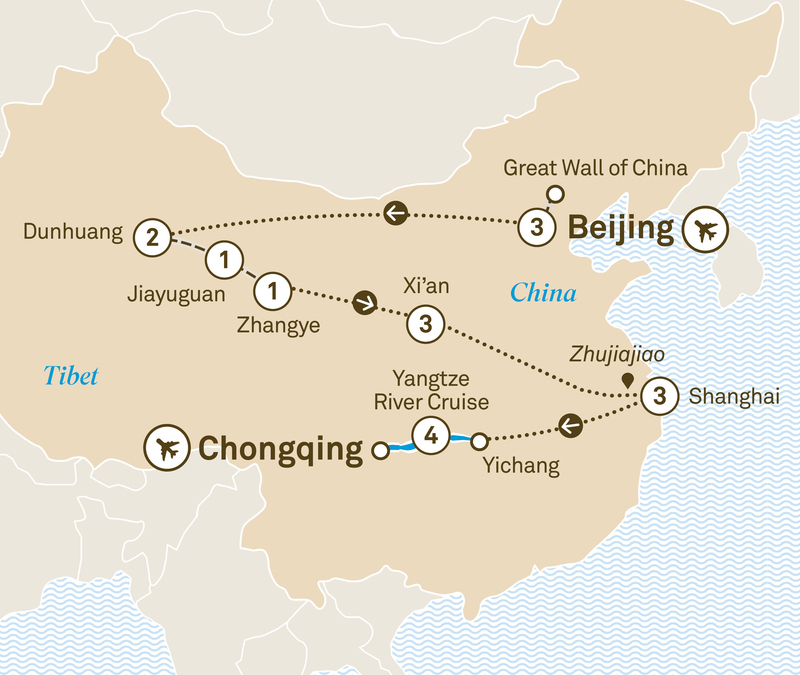 Disembark and visit Ciqikou and take a tour of Chongqing. This afternoon transfer to Chongqing airport.